We regularly receive requests from companies to collaborate on research into specific questions. There are many ways in which research can be carried out by or with our researchers. Together with the client, we decide on a form of collaboration that is appropriate for the scope and complexity of the issue. Generally speaking, this involves customised research. Our researchers are regularly involved in contract research with the aim of finding solutions to specific questions for companies. In such cases we always conclude agreements about intellectual property rights. Apart from working on current issues in industry, we also attach great importance to establishing long-term relations. In that context, TU Delft has strategic partnerships with parties including Fokker and Airbus. These partnerships involve not only research but also, for example, teaching, entrepreneurship and recruitment. 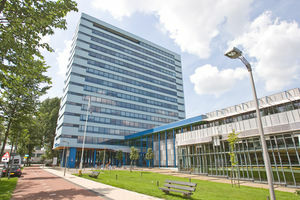 The Faculty of Aerospace Engineering participates in a large number of Dutch and European research projects, in many cases in collaboration with businesses. We are involved in various projects via European funding programmes such as Horizon2020, Clean Sky and SESAR. One example of these projects is ‘Regional turboprop loads control through active and passive technologies’ (ReLOAD), which is part of the Clean Sky 2 programme. We are keen to respond to the need for innovation in the aerospace sector. In open or joint innovation programmes involving several parties, we work on interesting and innovative ideas that have a cross-sectoral value. The Faculty of Aerospace Engineering is closely involved in a number of university-wide institutes that specialize in particular fields. Read more here. SAM | XL (Smart Advanced Manufacturing XL) is a collaborative research centre where technology is being developed, demonstrated, and de-risked for automated manufacture.